London: T. Cox, 1736. 2nd edition, with numerous Additions and Improvements. Leather bound. Good. Unpaginated. 36 cm. 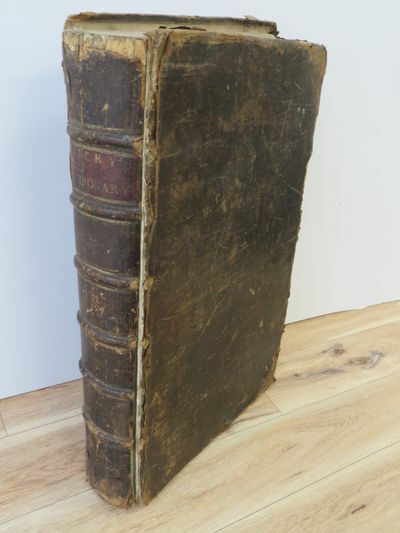 Full leather, worn at edges and corners, front board detached, along with endpapers and title page. Small ink notations on title page with small tear, missing second page of preface, stain at fore-edge, small tears on edges, small spots, spots p. 4T-4U. Last page missing. Orrery plate epicting Caesar swimming has been removed, glued to front pastedown with inscription. "Assisted in the Mathematical Part by G. Gordon; in the Botanical by P. Miller; and in the Etymological, &c. by T. Lediard, Gent. Professor of the Modern Languages in Lower Germany." Bailey (d. 1742) lexicographer, kept a boarding school at Stepney. Thirty editions of this dictionary appeared, the latest at Glasgow in 1802, and it was reprinted by various booksellers. Lord Chatham is said to have read it through twice, and Chatterton obtained many sham-antique words from Bailey. Johnson is said to have made this dictionary the foundation of his own.